The first time I visited the Mount of Olives, our group had taken a bus to the top and walked down. Midway down the mountain, we noticed a crowd gathered. As we approached, the crowd slowly dispersed, and a man, dressed in first century garb, with a donkey warmly welcomed us to draw near. 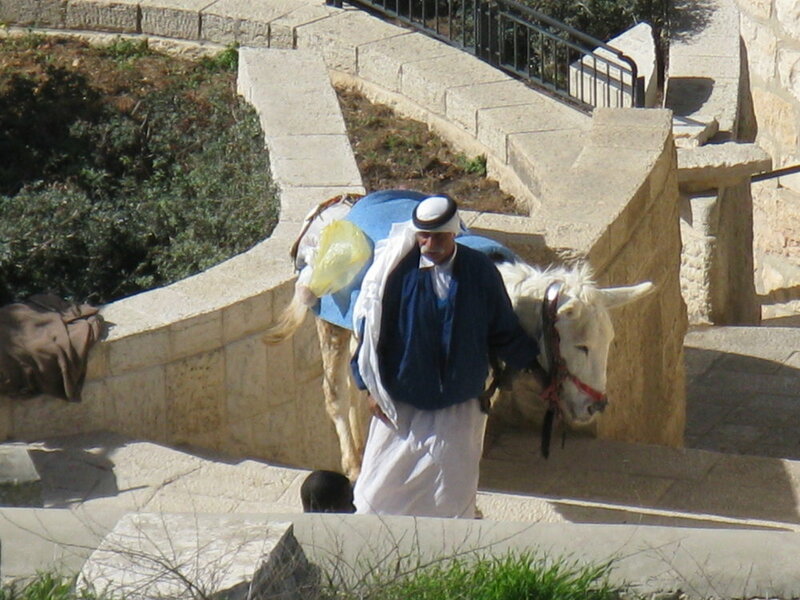 He shared that he was standing near the site where Jesus sent his disciples to retrieve a donkey to ride into Jerusalem. Then, with a wonderful mix of hospitality and entrepreneurship, he invited us to take a photo of his donkey and himself. I don’t know if that was the actual site of Bethphage, but that encounter etched this story into my memory and imagination! Can you imagine being among the crowd on that first Palm Sunday? Jerusalem, the ancient city of 25,000, would swell with visitors anticipating Passover, a feast that celebrates Israel’s deliverance from captivity. Jesus ambles in on a donkey as the crowd hails him and waves palm branches. This was as close as He would come to an earthly reign in his humble, human life. The procession descends the mountainside, not on a carefully crafted stone road that might be found within the city gates, but a dusty path flanked on both sides by gnarled, silver-leafed olive trees and regal palms. The path descends into the Kidron Valley, then up again, and into the City of David. The disciples must have been overjoyed as they mingled in the crowd. Jesus, their Jesus, the long awaited Messiah! “Hosanna!” “Save us,” the crowd cries. Wasn't this the culmination of all their hopes? Although the crowd is physically descending into the valley, the disciples are on an emotional mountaintop! However jubilant, the scene is not without risk. The symbolism of Jesus’ provocative entry wouldn’t have been lost on the Jews. They knew the scriptures well. The praise and longing for a Jewish King is mingled with protest of the Roman occupation. As Pastor Nate mentioned, the Roman and Jewish authorities were already on high alert, wanting to keep the crowds under control during Passover. So tensions are high when Jesus enters the temple, unleashing his fury upon religious leaders and chastising them for making God’s house of prayer into a shameful counterfeit. Immediately I recoil, “No, Jesus! What are you thinking? Inciting a riot within the temple is going to be trouble and that scares me! Calm down, rethink this, try to be less...offensive!” I don’t know if my response comes from knowing what the next several days bring for Jesus. Perhaps I would have been caught up in the moment and not notice the inherent risks. But I see them clearly today. Today, I want to save Jesus! I want Jesus to be the Messiah I’ve imagined. In truth, I want Him to do it my way. Yet...ironically...He wants to save us...God’s way! It’s that very act of saving that brings Him to this most loving, painful, and powerful week ahead. But be clear, Jesus’ actions are not apolitical. He knows exactly what he is doing; he is confronting worldly power. He rails against the corruption within the religious community. He doesn’t mince words, even when he knows the consequences. Then...He heals the sick...invites the outcasts in...and offers saving grace. He opens the doors and welcomes everyone! Will we follow? Even if we are afraid? Will we loosen our grip, relinquish control, turn from the idols we create, and follow Jesus?